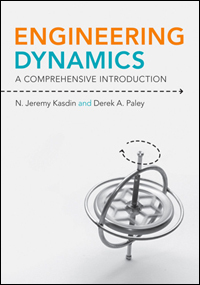 An undergraduate textbook on engineering dynamics by Professor N. Jeremy Kasdin (Princeton University?s Mechanical and Aerospace Engineering Department), and Associate Professor Derek Paley (AE/ISR) is in use at a number of highly-ranked engineering schools. Engineering Dynamics: A Comprehensive Introduction was published in 2011 by Princeton University Press. Schools using the textbook include the University of Pennsylvania, the Massachusetts Institute of Technology, Princeton University, the University of Maryland and George Washington University. The textbook introduces undergraduate students to engineering dynamics using an accessible, comprehensive and innovative approach. Students solve dynamics problems from the very start as the book gradually guides them from the basics to increasingly more challenging topics in a rigorous manner. The book spans the full range of mechanics problems, from one-dimensional particle kinematics to three-dimensional rigid-body dynamics, including an introduction to Lagrange's and Kane's methods. It features numerous real-world examples and problems, incorporating a wide range of difficulty; makes ample use of MATLAB for solving problems; includes helpful tutorials; makes suggestions for further reading; and contains detailed appendixes.